As a change of pace from my initial string of races in London, I headed out to the English countryside this past weekend. All the way to Berkshire. Which, it turns out, can be reached in a mere 26 minutes by train from London Paddington. Despite its proximity to the Big Smoke this is most definitely Wind In The Willows country. Suzanne and I stayed at a lovely country inn (The Olde Bell which is the oldest coaching inn in England) which is a short walk from the Thames. On Saturday we walked the six miles from the Inn to Henley-On-Thames which is the home of the Henley Royal Regatta, and will also be the host site for sculling during the London Olympics. One of the highlights of the town is the boating museum which features not only excellent displays on the history of boat racing, the history of the Thames Valley, and the history of Henley, but also has a wonderful Wind In The Willows exhibit. The reason for this jaunt out of town was for me to participate in a race called the Down Tow Up Flow Half Marathon. The race is an annual event and is usually run between Windsor and Marlow. The direction of the race reverses from year-to-year, thus the name. This year was meant to be Up Flow which should have been from Windsor to Marlow. However a portion of the Thames nears Windsor is already closed off for some Olympics prep, so this year's race actually started in Slough. The race proceeded along the Millenium river for a bit, and then joined the Thames to cover as much of the usual course as could be fit in. We had learned at the boating museum that the Millenium river is a completely man-made river, so it was then interesting to discover that it was now part of the race course. The other thing we had learned on Saturday was just how muddy the Thames towpath was after the incredible amount of rain we have had. This knowledge definitely cemented my plan to wear my VFF Flows for this race. Nothing like neoprene shoes to make running through mud more palatable. The day started with an early wakeup followed by a fabulous breakfast at The Olde Bell. The highlights definitely being the inn-made items such as granola, muesli, and banana bread. Definitely an effort to not overeat! Then I took a cab to Marlow where a coach awaited to take race participants to the starting line. At the start I picked up my race pack and did some stretching while I waited for the rest of the Run Dem Crew gang to show up. After not too long a wait I found the RDC West gang. While we were talking we were surprised to see a few people from RDC East coming our way. So we had a bit of an RDC gathering until it was time to start. The race was kicked off in three waves, and I was the only RDC person in the middle wave, so I ended up running the race on my own. Good thing I don't mind solo long runs! We started off with a lap around the park where the starting line was, then headed up a hill, over a bridge, and into some hilly terrain near the Millenium River. I was trying to keep my time around 5:20/km, but found that I was quite comfortable running closer to 5:12/km so I just went with that. For the early portion of the race I used the current pace information on my Garmin watch to calibrate myself into a set pace, then I switched over to lap average to make sure that I maintained consistency over each kilometer. The hilly section was at least fairly dry as it was quite exposed. Which was an issue as it was finally a bright sunny day! I was wearing my hydration pack so I focused on staying hydrated and on maintaining pace. It was definitely not as brutal as the Bupa 10k had been. Hot and sunny yes, but not punishing. Most of the way along the Millenium river was dirt path, with some gravel and rocks mixed in to bother those of us with minimal shoes. I was quite happy when we hit a stretch where we ran along a road for a little bit as we transitioned to the Thames. I was definitely much faster on the road, closer to 4:55/kilometer, and more comfortable. As we ran along the road, and then joined the Thames towpath we started to see small groups of people who were cheering us runners along. I tried to clap for each of these groups and say thanks. Always good to encourage supporters. I was flying along, especially on the paved sections of the course, but also making sure to appreciate the beauty of the scenery. Lots of stretches of calm river and tree-covered islands. Just lovely. Around 7 or 8 miles in we hit a nice patch where we took the streets of the village of Cookham and ran along tree-lined streets for a bit. Really started flying at that point, and was definitely entertaining the possiblity of coming in around 1:47 or so. Then we hit the last patch and the course started eating away the time. First we returned to the dirt path, and started hitting some mud. Then there was the bridge. This was only reachable via a narrow stairway which brought everyone to a walk. Then the bridge itself was narrow and the pace was whatever the people in front of you wanted to do. Which, in my case, was not as fast as I wanted to go. Then stairs back down on the other side. Followed by a long patch of very narrow path with no possibility of passing. All in all I lost close to an entire minute on that one stretch, Finally things widened out and I could swing around the slower people and pick up some speed. But from that point on the course got muddier and muddier. I definitely made better time than many simply because I was prepared to run straight through the mud puddles if the alternative was to slow down. At one gate a race marshal was encouraging people to take it slowly because it was so wet, and many people slowed way down to avoid dirtying their trainers. I just ran straight on and kept going. Very satisfying. But even running straight through the mud was not enough to keep up speed. Too much energy was lost on every stride due to the lack of resistance. There just wasn't any bounce to the terrain. Where it wasn't muddy it was grassy. Nice thick grass. Lovely to lie in. Lovely for cows to graze on. (And yes, there were cows grazing! They didn't seem to think much of us racers.) Slow for runners. In places there were thin tracks of harder dirt through the grass, but that was narrow enough that sticking to it was a challenge in itself. Gradually I felt that desired time slipping away. I just lost a bit with every kilometer. Struggling to keep up the pace, but just losing too much to the terrain. I revised my hopes downwards and pushed for sub 1:50. Sadly not even that was doable. I hit the final stretch, was ready to push to the finish, and discovered that the last couple of hundred metres were an unbroken field of that plush grass. Just couldn't get the speed I needed on that. I did have a little push for the very end, and finished with a quite satisfactory time of 1:50:13. Which was more than seven minutes faster than my previous half marathon PB. While the course was muddy, the race organisation was excellent. Hats off to the folks at Purple Patch Running for this one. Very clear communication before the event. Very organised pre-race bus and race packet pick-up. Smooth start. Lots of friendly marshals along the course. And a really nice medal. I definitely suggest checking them out if you are looking for a race for yourself. I also have to give a shout out to Sussex Sports Photography. The picture above is one of theirs, and I think they took some of the best action shots of me running I've seen so far. I don't usually even think about buying race photos, but this was so good I had to have it. 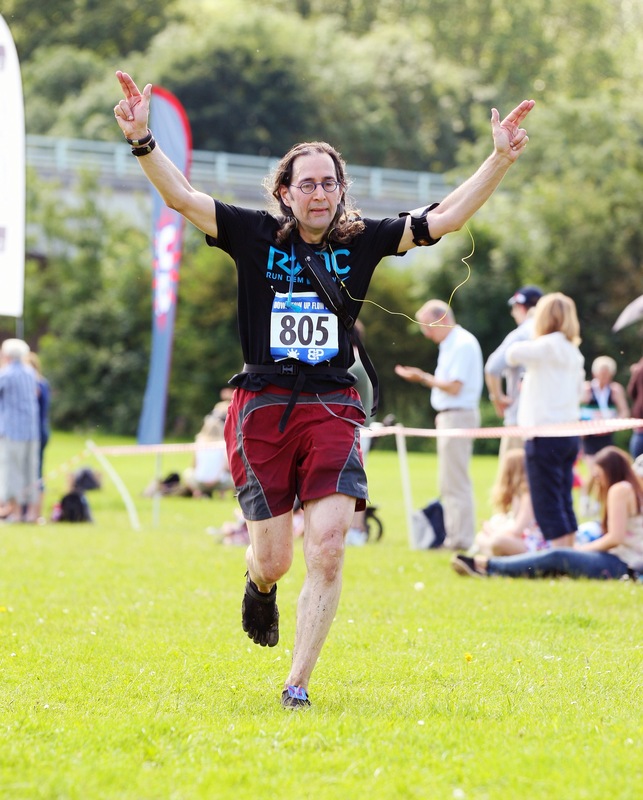 And finally, big ups to the RDC crew, including one of the youngers, who completed their first half marathon. This was a tough course, and they stuck it out to the end. This page contains a single entry by Daniel Maskit published on July 25, 2012 9:35 PM. Proper British 10k was the previous entry in this blog. The Science of Training is the next entry in this blog.